REGARDED AS FRANCE'S GREATEST and most popular singer, French superstar and cultural icon Edith Piaf makes the most of her wonderful gift as the Edith Piaf: The Perfect Concert & Piaf: The Documentary set makes its UK DVD premiere. 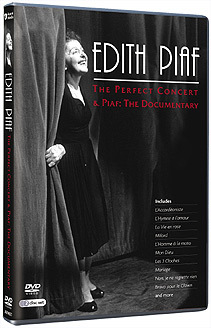 Combining a unique collection of filmed and recorded performances by Edith Piaf, this spectacular two-disc set captures many of her finest and best loved works. Coupled with an in-depth and unique documentary featuring several rare and extraordinary interviews, this set is an incredible and revealing portrait of one of the world's favourite performers. With her unique voice and natural gift of showmanship, Piaf's songs often reflect her turbulent life  especially the heart-rending ballads that she was so famous for. The Perfect Concert features stunning versions of seventeen classic songs, including the magnificent La Vie En Rose, the unforgettable Non Je Ne Regrette Rien, Milord, the hauntingly lovely L'Hymne a l'amour (Holiday In Paris, 1952) and the delightful Sale Petit Brouillard. With an extraordinary ability to mesmerise her audiences, Edith Piaf is very theatrical and compelling to watch; turning out powerful, energetic and especially memorable performances. To experience Edith Piaf is to experience Perfection  she is truly majestic, dramatic, impish and emotional while remaining modest, self-critical and natural. Piaf: The Documentary is a film by Marianne Lamour and both this and Edith Piaf: The Perfect Concert are produced by Raymond Blumenthal with Karine Karsenti as Director of Production. Along with interviews of Edith, others talk of the singer and her emotive songs. There are references to her early life; her rise to prominence and her joys as well as her disappointments and tragedies. Edith Piaf's life reads like an epic novel. Deserted by her mother at birth, Edith lived in a brothel with her paternal grandmother. Her mother was Line Marsa, a beautiful singer who was to end her life full of drink and drugs in the winter of 1945. Edith's father, Louis Gassion, was a soldier and unable to care for her. Edith was a sickly child with impaired vision and only the working girls showed her a little bit of affection. Her grandmother didn't much like her; but when Edith sang, even the neighbours opened the windows to listen to her. The little girl was taken to the sanctuary of Saint Th�rese de Lisieux and by some miracle she regained her sight. All her life she would believe in the supernatural. Her father was a contortionist at a fairground and he finally took her away from the brothel. He had many mistresses and was not always kind to her and in 1930, at the age of 15, Edith ran away and began living on the streets of Paris, finding solace with her "sister" Momone; singing and hanging around the bars of the Pigalle, refusing to be drawn into prostitution. Edith had a child, Marcelle, who died when just a few months old. She then fell in love with a legionnaire. But Louis Lepl�e, the owner of a nearby cabaret bar heard her singing and took her under his wing, exploiting her urchin looks. Her magnificent voice filled the house and the poor little girl from the slums of Pigalle finds herself singing for the likes of Maurice Chevalier. Louis gave her the name 'The Little Sparrow'; she calls him Papa Lepl�e. Sadly, he is to be murdered by gangsters and Edith is grief stricken. In the hands of songwriter Raymond Asso, Edith Piaf's voice becomes controlled and develops further, but romance is never far away and Edith finds love for a while with singer Paul Meurisse. She falls in love again; invites Yves Montand to take part in her show in 1944 and the following year hires an accordion player from Mistinguiette, Marc Bonel. She sings with Les Compagnons de la Chanson (Dim Dam Dom, 1969) and has a romance with Jean-Louis Joubert. Her voice is called "The pulse of Paris". Across the Atlantic, America is not so sure of The Little Sparrow, but Mr and Mrs Henry Ford, Gregory Peck, Marlene Dietrich  who teaches her to speak English  and President Eisenhower are among those who flock to see her perform. And another romance, this time with boxer Marcel Cerdan, but tragedy is not far behind. Charles Aznavour writes J�zabel for Edith and she is singing all over the world, earning a seven-minute ovation at a packed Carnegie Hall in the USA. She writes more songs and receives the grand prize from the Academie du Disque but, after George Moustaki composes Milord for her and they go on tour together in 1958, George loses control of his car on Highway 10 on a rainy night and crashes underneath a truck. Edith is badly hurt and it is the start of her health problems. She writes Mon Dieu, Les Mots d'Amour and the famous Non je ne regrette rien  Charles Dumont and Michel Vaucaire compose the music for these unforgettable masterpieces. Much of Piaf's genuine passion in performance stemmed from the roots of her childhood and the challenges she faced in life. From her humble beginnings in Paris, Piaf's life, loves and losses only served to make her rise to fame and glory even more triumphant. Piaf: The Documentary charts this story with rare interviews, footage of Piaf herself  including home movies, an excerpt from Jean Cocteau's Le Bel Indifferent in 1940, an extraordinary interview from the time of her manager's tragic murder in 1936 and her marriages, latterly to Theo Sarapo. Edith Piaf is intriguing with an enormous personality for such a tiny frame. The talent, wit, charm, and contagious laugh lives on for the tragic child who became a worldwide star. Edith Piaf died on 10 October 1963, at the age of 47. She believed in life after death and if this is so, she has no regrets and is singing with the angels. And there'll be no regrets for anyone who owns this two-disc DVD or shares it with someone close. It's a unique treat for all fans of the charismatic Edith Piaf  an in-depth portrait of the tiny woman who became a towering legend.